The southern provinces of Maysan, Dhi Qar, Muthanna, and Basra are populated almost entirely by Shi’a Arabs, in the major cities of Amarah, Nasariyah, and Basra, as well as in the rural marshlands. Of these provinces, Basra is the primary economic hub. Iraq’s southernmost province, Basra is situated along the Shatt al-Arab waterway, where the Tigris and Euphrates Rivers flow together into the Persian Gulf. Basra province, which shares the name of its provincial capital, contains Iraq’s largest oil reserves.1 It is the only Iraqi province with maritime access, and is therefore home to Iraq’s lucrative ports, though which Iraq exports most of its oil.2 Therefore, while Baghdad may be the political capital of Iraq, Basra has long been Iraq’s economic capital. The city itself spreads out along the western bank of the Shatt al-Arab, roughly thirty miles from the Persian Gulf. The Basra Palace is located along the water, in the southeastern part of the city. The city center, with its historic neighborhoods, is situated to the north and west of the palace. Highway 6 runs parallel to the Shatt al Arab through western Basra, dividing the center of the city from the western slums of al-Hyyaniyah, al-Husayn, and the outlying neighborhoods along a second highway that runs southwest from Basra towards Kuwait. At the northern edge of the city, the Qarmat Ali River flows eastward into the Shatt al-Arab. The University of Basra, Basra’s smaller Maqal airport, and the Basra power plant lie along its southern bank. From the southern edge of the university, a third highway runs west towards Nasiriyah. The airport, which lies five miles west of the city, has served as the single Coalition base in the area since British forces pulled out from the city center last summer. Basra is the third-largest city in Iraq and the largest south of Baghdad.3 It has traditionally been among the most cosmopolitan cities in Iraq, with a rich history that dates to the seventh century. While the population is predominantly Shi’a, there are pockets of Sunnis and Christians.4 These groups have generally coexisted peacefully, earning Basra a reputation for being a tolerant and secular city. The city is also socioeconomically diverse. Basra has a large, well-educated middle class;5 yet, it also has a sizeable lower class, whose members have largely come from Maysan Province and northern Basra Province. Following the draining of the marshes in the early 1990s, these migrants moved south and settled in the neighborhoods on the outskirts of Basra, such as al-Hyanniyah, al-Husayn, al-Jumhuriyah, and Khamsa Meel.6 These poorer neighborhoods became the main Sadrist strongholds of Basra. During the 2003 invasion, Basra was the first Iraqi city to fall to the Coalition. British forces then took responsibility for Basra province and the three neighboring provinces to the north—Maysan, Dhi Qar, and Muthanna. Britain’s hasty planning left it without a well-conceived strategy for Basra’s post-conflict stabilization.7 Consequently, while Basra was relatively calm during the early years of the war, the state’s collapse of enabled Islamist parties—namely the Sadrist Trend, the Islamic Supreme Council of Iraq (ISCI), and Fadhila—to expand their influence and roles in Basra.8 These groups were able to solidify their standing as the primary players in the political process during the January 2005 elections.9 At this time, the British looked upon any Iraqi tribal movements in Basra were with suspicion. For example, the first British candidate to head Basra’s advisory council, the top sheikh from the Bani Tamim tribe, was vehemently rejected by the other factions in the city.10 After this, the primary shareholders in the Basra political system were the Islamist political parties, all of which were backed by their militias. Throughout this time, militia groups intensified their attacks on the British forces in Basra. As the quantity and the quality of the attacks increased—especially with the initial employment of sophisticated and lethal explosively-formed penetrators (EFP) in mid-2005—British forces became ever more limited in their physical movements.13 “With British forces spending increasing amounts of time at their bases, militiamen also upped their mortar and rocket attacks on [their] bases, exploiting the reduction of preemptive patrols by British forces.”14 As a result, British forces became less and less able to reverse the deteriorating security situation. The Basra Operations Command (BOC) had been created by the Iraqi government in June 2007 to improve the Iraqi command structure.24 Modeled on the Baghdad Operations Command, the BOC oversaw all Iraqi Security Force (ISF) operations in the province and coordinated with the Coalition to manage the security transition during the British withdrawal.25 Lt. General Mohan al-Freiji, who was previously responsible for security in Karbala, was appointed to head the command; he worked closely with Maj. Gen. Jalil Khalaf, the chief of police in Basra, who was given the difficult task of purging the Basra police force of militia elements. While Mohan and Jallil were seen as “the last hope for Basra” by both the British forces and the Iraqi government, they were unable to reassert government control over the city as the British drew back. This central government was equally unable to enforce its political rule in Basra. In late July 2007, as the British withdrawal was underway, Maliki fired the Basra Governor Mohammed Waeli, who was a member of the Fadhila Party. Maliki had come under increasing pressure to dismiss Waeli, following a no-confidence vote by the Basra Provincial Council. The vote was initiated by ISCI representatives (who hold 20 of 41 seats on the Council but were able to muster a majority of votes) on grounds of corruption and oil smuggling.26 Maliki ratified this dismissal on July 28, 2007; however, Governor Waeli refused to step down and referred the order to the federal Supreme Court.27 Maliki was powerless to enforce the order as Waeli remained in power, demonstrating the weakness of the central government. Daily violence—gunfights, assassinations, corruption, intimidation, and criminality—persisted, as did the intimidation of the local population. This presented an enormous challenge for the central Iraqi government and the Coalition, which faced the prospect of holding provincial elections by late 2008. It was under these conditions that Maliki decided to launch his offensive in Basra. 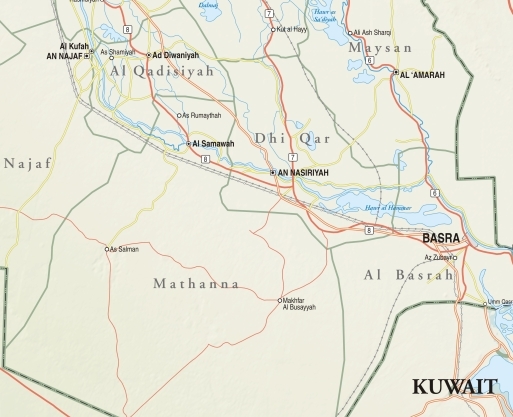 Following the clearing of Basra in the spring of 2008, Iraqi soldiers with the 1st Iraqi Army Division, who were sent from Anbar at the onset of Operation Knight’s Charge, entered Maysan province to continue their offensive against Shi’a militants. On June 12, large numbers of Iraqi Security Forces arrived in the province and began preparatory operations—fanning out through the provincial capital of Amarah; reconnoitering and clearing key routes; and replacing the guards along the Iranian border to interdict criminal movements. Like he did in the Basra and Sadr City offensives, Prime Minister Maliki also gave an ultimatum for gunmen in Maysan to turn in their weapons. On June 19, the day the ultimatum expired, the Iraqi Security Forces launched Operation Promises of Peace, to clear JAM and Special Groups criminals from Amarah.36 The security offensive in Maysan met with minimal enemy resistance; Sadrist politicians and clerics, wishing to avoid the destruction that accompanied the push into Sadr City, instructed their followers not to resist the government’s operations. Moreover, any Special Groups and JAM leaders that remained in Maysan in the wake of the Baghdad and Basra offensives fled to Iran before the operations commenced in Amarah. Since mid-2008, security in the southern provinces has been stable, although Iranian-backed militia and JAM elements are still present in the south and seeking to rebuild their networks. On March 31, 2009, responsibility for Multi-National Division-Southeast (MND-SE, which is comprised of Basra province) was transferred from British Maj. Gen. Andy Salmon to the commander of Multi-National Division-Center (MND-C), Maj. Gen. Michael Oates.37 Upon the transfer, MND-C and MND-SE combined to form Multi-National Division-South (MND-S). MND-S encompasses all of the provinces south of Baghdad. Excerpted from Marisa Cochrane, “The Battle for Basra,” Iraq Report 9, Institute for the Study of War, June 23, 2008; Marisa Cochrane, “Special Groups Regenerate,” Iraq Report 11, Institute for the Study of War, September 2, 2008. 1 Sam Dagher, “Basra Oil Fuels Fight to Control Iraq’s Economic Might,” The Christian Science Monitor, September 19, 2007. 2 United States Energy Information Agency, Country Analysis Brief: Iraq, Last Updated: August 2007. 3 Population estimates for Basra city vary greatly. 2003 estimates hover between 1.3 million and 1.7 million. Estimates for Basra province are closer to 3 million. 4 International Crisis Group, “Where is Iraq Heading? Lessons from Basra,” Middle East Report No. 67, June 25, 2007, p. 1. 5 Stephen Farrell, “Divining a Lesson in Basra,” The New York Times, May 25, 2008; Michael Knights and Ed Williams, “The Calm Before the Storm: The British Experience in Southern Iraq,” The Washington Institute for Near East Policy, Policy Focus #66, February 2007, p. 4. 6 International Crisis Group, “Where is Iraq Heading? Lessons from Basra,” Middle East Report No. 67, June 25, 2007, p. 1. 7 British forces initially planned to enter Iraq via the north, through Turkey. This was only changed less than three months before the invasion in January 200,3when the Coalition decided it would invade from the south and British forces were instead given responsibility for Basra and Maysan province. Michael Knights and Ed Williams, “The Calm before the Storm: The British Experience in Southern Iraq,” The Washington Institute for Near East Policy, Policy Focus #66, February 2007, p. 6. 8 For more information on the main Shi’a political parties in Basra, see “Fact Sheet on Iraq’s Major Shi’a Political Parties and Militia Groups, April 2008,” Institute for the Study of War, April 2008. 9 Edward Wong, “Shiite Morality is Taking Hold in Iraq Oil Port,” The New York Times, July 7, 2005. 10 Michael Knights and Ed Williams, “The Calm before the Storm: The British Experience in Southern Iraq,” The Washington Institute for Near East Policy, Policy Focus #66, February 2007, p. 12. 11 International Crisis Group, “Where is Iraq Heading? Lessons from Basra,” Middle East Report No. 67, June 25, 2007, p. 12. 12 Michael Knights and Ed Williams, “The Calm before the Storm: The British Experience in Southern Iraq,” The Washington Institute for Near East Policy, Policy Focus #66, February 2007, p. 27; International Crisis Group, “Where is Iraq Heading? Lessons from Basra,” Middle East Report No. 67, June 25, 2007, p. i. 13 Michael Knights and Ed Williams, “The Calm before the Storm: The British Experience in Southern Iraq,” The Washington Institute for Near East Policy, Policy Focus #66, February 2007, p. 27, 30. 14 Michael Knights and Ed Williams, “The Calm before the Storm: The British Experience in Southern Iraq,” The Washington Institute for Near East Policy, Policy Focus #66, February 2007, p. 30. 15 Mona Mahmoud and Mike Lanchin, “Basra militants targeting women,” BBC News, November 15, 2007; Andrew North, “Basra’s new era brings new fears,” BBC News, December 14, 2007. 16 Michael Knights and Ed Williams, “The Calm before the Storm: The British Experience in Southern Iraq,” The Washington Institute for Near East Policy, Policy Focus #66, February 2007, p. 31. 17 Stephen Farrell and Ammar Karim, “Drive in Basra by Iraqi Army Makes Gains,” The New York Times, May 12, 2008; Leila Fadel, “Basra sings again as Iraqi Army patrols the streets,” McClatchy, May 24, 2008. 18 Stephen Farrell and Ammar Karim, “Drive in Basra by Iraqi Army Makes Gains,” The New York Times, May 12, 2008. 19 Raymond Whitaker, “Operation Sinbad: Mission failure casts doubt on entire British presence in Iraq,” The Independent, October 8, 2006. 20 International Crisis Group, “Where is Iraq Heading? Lessons from Basra,” Middle East Report No. 67, June 25, 2007, p. i. 21 Karen DeYoung and Thomas E. Ricks, “As British Leave, Basra Deteriorates; Violence Rises in Shiite City Once Called a Success Story,” The Washington Post, August 7, 2007. 22 Michael Knights and Ed Williams, “The Calm before the Storm: The British Experience in Southern Iraq,” The Washington Institute for Near East Policy, Policy Focus #66, February 2007, p. 9. 23 Stephen Farrell, “British Troops Begin Withdrawal from Basra,” The New York Times, September 3, 2007. 24 Luke Baker, “Britain backs "M and J" as southern Iraq security honchos,” Reuters, November 1, 2007. 25 Sam Dagher, “As British troops exit Basra, Shiites vie to fill power vacuum,” The Christian Science Monitor, September 17, 2007. 26 Michael Knights and Eamon McCarthy, “Provincial Politics in Iraq: Fragmentation or New Awakening?”, Annexes, Policy Focus #81, The Washington Institute for Near East Policy, April 2008. 27 United Nations Security Council Report S/2007/608, October 2007, p. 3. 28 While initially it seemed that the British pullout from the city resulted in a decrease in violence, by December 2007, when formal provincial control was turned over to the Iraqis, it was widely understood that the security situation had worsened in the intervening months. Sam Dagher and Abdul-Karim al-Samer, “British hand over Basra in disarray,” The Christian Science Monitor, December 17, 2007. 29 Sam Dagher and Abdul-Karim al-Samer, “British hand over Basra in disarray,” The Christian Science Monitor, December 17, 2007. 30 International Crisis Group, “Where is Iraq Heading? Lessons from Basra,” Middle East Report No. 67, June 25, 2007, p. 11-12. 31 James Glanz and Alissa J. Rubin, “Iraqi Army Takes Last Basra Areas from Sadr Force,” The New York Times, April 20, 2008. 32 Marisa Cochrane, “The Battle for Basra,” Iraq Report 9, Institute for the Study of War, June 23, 2008, p.8. 33 Marisa Cochrane, “The Battle for Basra,” Iraq Report 9, Institute for the Study of War, June 23, 2008, p. 9. 34 Marisa Cochrane, “The Battle for Basra,” Iraq Report 9, Institute for the Study of War, June 23, 2008, p. 10-13. 35 Marisa Cochrane, “The Battle for Basra,” Iraq Report 9, Institute for the Study of War, June 23, 2008, p. 15. 36 Multi-National Corps-Iraq Press Release No. 20080620-06, “ISF clear insurgents out of Amrah,” Multi-National Corps-Iraq PAO, June 20, 2008. 37 Multi-National Corps -Iraq Press Release No. 200900401-01, “MND-C, MND-SE combine to create MND-South,” April 1, 2009.